For those interested in the Harvard mentioned in Saturdays post, it is based in Motueka NZ but retains its US registration N4269P, It is a T-6G model s/n 51-17355 c/n 195-2, originally delivered to the Portuguese Air Force. More pics of Saturdays visit can be found on Gavin's blog HERE. Qantas have made a few changes to their Wellington-Sydney return flights. The flight operates double daily and had been a double daily Boeing 737-400. It has now moved to complete opposite ends of the scale with the morning flights QF118/47 now being operated by the old 737-300 while the afternoon flights QF48/117 are now operated by the new 737-800, although both flights on Saturdays and Sundays are operated by the 738. The change occurred yesterday Sunday 25-Jan-2009 with QF118 being canceled, then VH-VXD operating QF47/48 and VH-VXF operating QF117. The 738 is scheduled to operate on this route until Saturday 07-Mar-2009. On Saturday 24-Jan-2009 QF57 Brisbane-Wellington operated by ZK-JNN diverted to Auckland landing around 0330 (25/01/09) local. This departed Brisbane 4hrs late at 2130 local, and due to the curfew at Wellington was forced to divert to Auckland. It positioned to Wellington later in the day before operating Sundays QF58/57. Yesterday Sunday 25-Jan-2009 QF6171 a repositioning flight was scheduled from Wellington-Christchurch. This was supposed to depart Wellington at 0600 but was delayed until 1700. This flight was to move ZK-JTP which had just come off the Sydney route as discussed above. Due to ZK-JNN having to divert to Auckland, ZK-JTP was pressed into service on the Melbourne route QF38/37 hence the delay in the repositioning flight until 1700. Due to an over supply of Virgin Blue crew, Pacific Blue are returning one 737-800 to the Virgin Blue fleet, they will then wet lease it back to operate their services. It is not yet known which bird this will be. Gippsland GA8 Airvan ZK-TZT c/n GA8-03-040. This bird was originally registered to Sounds Air as ZK-KLC on 15-Jan-2004, after importation into NZ as VH-BQR. After flying for Sounds Air and sister companies it was sold to Iszard Pacific Aviation of Spring Hill as part of the deal which saw Sounds Air take ownership of former Iszard Pacific Cessna Caravan ZK-TZR, as well as the reregistration from KLC to TZT. The reregistration took place on 23-Sept-2008. It is recorded as changing ownership to Iszard's on 02-Oct-2008, the same day it was noted flying from Picton to Taupo. It then was noted on 04-Jan-2009 operating Taupo-Omaka-Picton. On 18-Jan-2009 it was noted in Wellington possibly operating a Sounds Air service. It is still registered to Iszard Pacific, but since it has been in Sounds Air territory for the past month, there is doubt as to whether it is still with them or has reverted back to Sounds Air. Today it was parked up and tied down at Omaka. 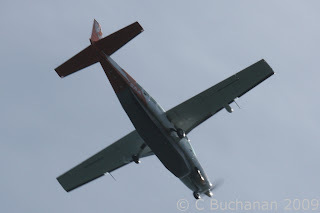 Arriving into Woodbourne at exactly 11.16am this morning was Pionair Convair VH-PAL. The convair arrived direct from Mount Cook airfield. 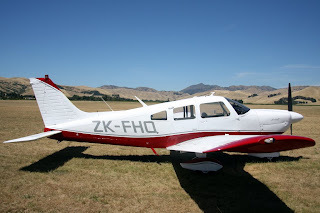 Two other visiting PA-28s on the field were Piper PA-28-140 ZK-CIJ, a privately owned Timaru based bird. And also Piper PA-28-161 ZK-MBK of Massey University School of Aviation. The Stearman ZK-BWR was again noted doing circuits this morning at Omaka. Also noted around lunch time were the Chequers doing a small display for the cadets on the ATC National Aviation course, that has been held here. 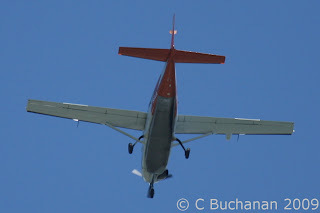 Also departing Marlborough to the north during the afternoon was locally owned Piper PA-28-180 ZK-SNE. Linfox's CL-60 VH-LEF arrived into Wellington shortly after 2200 direct from Essendon Airport in Melbourne. It was using Victor Hotel Lima Echo Foxtrot as its call sign, as it overflew Marlborough on decent. A busy morning with the departure from Omaka of two classic biplanes. Blenheim based DeHavilland DH82A Tiger Moth ZK-BMY and Omaka restored Boeing Stearman A75N1 ZK-BWR departed in convoy and appeared to be heading south. Bit of a busy day in the skies today. Other aircraft noted training in Marlborough were two Cessna 152s of Hawk Enterprises of Fielding. ZK-VGB was noted making a ponds departure from Omaka heading north, while at the same time ZK-FPH was noted making a ponds arrival. Arriving into Woodbourne at lunchtime was RNZAF P-3K Orion NZ4205. This departed again early afternoon. 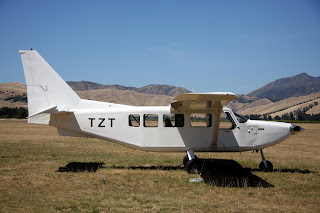 Noted in Wellington on Sunday 18-Jan-2009 was former SoundsAir GA8 Airvan ZK-TZT in an all white c/s. Noted passing Marlborough possibly tracking from Wellington to Christchurch was an aircraft using the callsign MUST15 this is believed to be Wellington based Cessna Citation Mustang ZK-MUS. Also noted late morning was PC12 VH-OOI arriving at Keri Keri in Northland from Norfolk Island. As mentioned in the post below RNZAF Boeing 757-2K2 NZ7571 operated through Woodbourne on Monday 12-Jan-2009. It is believed that this was bringing in ATC recruits for the annual ATC National Aviation course at Woodbourne, which began on Monday. Aircraft noted operating around Woodbourne and Omaka as part of the ATC course have been Marlborough Aero Club PA-38-112s ZK-DMF and ZK-EQH, Canterbury Aero Club PA-38-112 ZK-ESG, Privately owned PA-38-112 ZK-FML and Air New Zealand Sports & Social Club Cessna A150L ZK-DMG. The good thing about the National ATC course is all aircraft and instructors are donated/donate their time, for the course. Operating through Woodbourne on Thursday 16-Jan-2009 was French Army Casa 235 52IH 107. It is believed it arrived from Ohakea, and it departed to Wellington arriving 1900. Boeing 737-3K2 ZK-SJE suffered 'ramp rash' at Wellington airport on 16-Jan-2009, it is unknown what caused the problem, but it is reported as a decent gash in the fuselage. SJE was noted nosed into the Air National hanger for the entire day 17-Jan-2009. Australian Aviation magazine is reporting that Qantas Boeing 737-476 VH-TJZ will be retired from the mainline fleet this month and move to Jetconnect's fleet as ZK-JTS. It is believed once this has occurred that Boeing 737-376 ZK-JNB will join sister ship ZK-JNO in retirement, in preparation for conversion to freighter for Qantas freight operator Australian Air Express. Pacific Blue operated Virgin Blue Boeing 737-8FE VH-VOX between 05-Jan-2009 and 14-Jan-2009. This covered the maintenance period of ZK-PBF, PBL and PBM. Reims/Cessna F406 ZK-VAF was sold to Kiwi Air Limited of Gisbourne on 01-Dec-2008 with the registered owner changing on 13-Jan-2009. Kiwi Air also operate former Vincent F406 ZK-XLC (formerly ZK-VAA). Dash 8-102 ZK-VAC is currently operating for Solomon Airlines in the Solomon Islands, while their Twin Otters undergo maintenance. VAC is due back in Wellington in March. A few changes to the Air New Zealand Link schedules today. Eagle Air operated an extra Blenheim-Wellington flight this morning NZ2940. This afternoon saw the first of a new afternoon Air Nelson Q300 flight on the Wellington-Blenheim-Wellington route. The flight is NZ8161/62 which arrives into Blenheim at 1620 and departs back to Wellington at 1640. It is scheduled to operate for only the next two weeks and replace two or three Eagle Air B1900D flights. 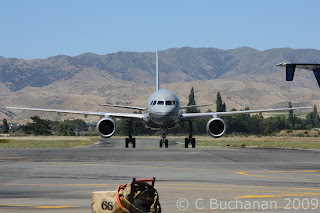 Also noted flying out of Blenheim today heading towards Wellington was RNZAF Boeing 757-2K2 NZ7571. Due to wind direction this had earlier snuck in and landed on runway 06. A change with the morning Eagle Air arrivals into Woodbourne. NZ2124 Christchurch-Blenheim was cancelled instead we had an extra arrival from Wellington with NZ2911 arriving. Marlborough's famous summer strong gusty NW/NNW winds were at it again today. 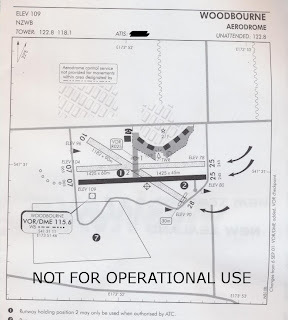 While nowhere near as bad as the winds regularily seen at Wellington, they can still surpass cross wind limitations for the scheduled aircraft that operate into Woodbourne. For the first time in a while it was noted that the lighter aircraft were using Grass 28, the smaller cross runway. Seen in the chart below. air2there, Sounds Air and Flight Corp were all noted using this runway to try and combat the effects of the strong gusty cross winds. Air New Zealand Link's B1900Ds and Q300s still used the main runway 24. Interestingly enough the 1900Ds have the specs to operate from grass 28 but due to there being no operational stats available they do not. The last scheduled Eagle Air flights to operate from grass 28 were in the Embraer Bandeirante's, which regularily used grass 28 in difficult cross wind situations. RNZAF King Air NZ1882 flew the Ohakea-Woodbourne-Ohakea route again today. Air New Zealand Link / Eagle Air flight NZ2304 Timaru-Wellington was cancelled this afternoon, with the Beech 1900D instead positioning from Timaru to Blenheim as NZ2918. Qantas Jetconnect's woes in NZ skies continue. Yesterday 06-Jan-2009, one AKL-WLG return service was cancelled and two others ran late by 3 and 4 hrs respectively. Yesterdays QF118/117 WLG-SYD-WLG operated by Boeing 737-476 ZK-JTQ operated via Auckland. The WLG-SYD leg was over 2hrs late departing WLG and was combined with QF2704 WLG-AKL. The aircraft then flew AKL-SYD. The resulting delay caused the return SYD-WLG to operate 5.5hrs late. This is on top of many customer complaints and general outrage after Qantas/Jetconnect announced that the AKL-WLG-AKL route would be reduced severely to enable one of the fleet to undergo maintenance. Hopefully the announced fleet replacement from (B733/4 to B738 ) happens sooner rather than later, and the on time stats improve. Otherwise Qantas's presence in NZ seems futile, with the current level of bad press, customer anger and regular delays and cancellations. It will also improve the Queenstown flights as the 738s are RNP equipped, meaning the regular cancellations and diversions due to weather will cease, as the aircraft will be able to make it into ZQN in most weather situations. One of the benefits of the holiday period in the Marlborough Sounds, is seeing the Sounds Air Cessna Caravan fleet flying low over the sounds, on their WLG-PIC-WLG runs. I want to start off the year by wishing everone a safe, properous, and happy New Year, full of many great spotting opportunities. Airwork/Airpost Boeing 737-219QC ZK-NQC arrived into Woodbourne from Auckland. NQC was noted on 02-Jan-2009 parked behind the skyhawk pen between #4 & #5 hangers at Woodbourne. It is believed that it is at Woodbourne for Safe Air to either undertake repainting or more maintenacnce work. Former Sounds Air and now Iszard Pacific Gippsland GA8 Airvan ZK-TZT was reported as operating Taupo-Omaka-Picton. Arriving from parts north, believed to be Ohakea mid morning was RNZAF Boeing 757-2K2 NZ7571. It later departed heading south presumably to Christchurch.